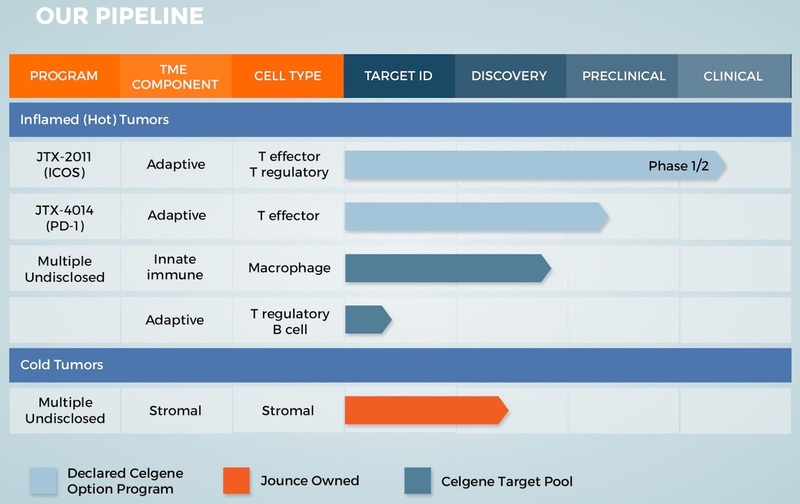 Jounce Therapeutics ($JNCE) is debuting on the public markets today after raising $102 million dollars in its initial public offering. The fully diluted market cap based on the price of the shares sold would be approximately $550 million. Jounce is entering the highly active immuno-oncology (I/O) space, focusing on monoclonal antibodies, with the hopes to identify potent combinations to activate the immune system against cancer. Jounce has a high powered team of scientific co-founders and advisors, including Jim Allison, one of the pioneers of immune checkpoint blockade. They were initially seeded by Third Rock Ventures in 2013, and have picked up additional financial backers during their development. I listened to their IPO presentation (retailroadshow) and below are some of my initial thoughts. Their S-1 prospectus can be found here. Jounce stated a number of guiding principles about how they wanted to distinguish themselves in the crowded, but exciting, space of immuno-oncology. One tenet is that they want to make I/O more personalized, and give the right I/O treatment to the right patients. Compared to certain targeted therapy approaches using kinase inhibitors (e.g. TRK inhibitors in TRK-fusion driven cancers), I/O has often taken a less selective approach. This is because, so far, while some biomarkers in use can be useful (see nivolumab's failure in NSCLC using less PD-L1 selection than Merck), they are not great at predicting at the individual patient level who will respond or not respond, as some with no PD-L1 respond and many with high PD-L1 levels do not. Jounce stated that they want to continue to develop better biomarkers for use in guiding the development of their therapies. To accomplish this, a core part of the company is their "translational science platform", which is focused on characterizing (at both the RNA and protein level) human tumors, and their immune components, to identify potentially useful biomarkers and novel targets. Most immunotherapy in cancer so far has been focused on the T cell. While Jounce's first candidate (JTX-2011), an agonistic antibody of ICOS, is intended to modulate the T cell response against cancer, they intend to expand their pipeline to target other aspects of the tumor-immune interaction. They are also focused on tumor-associated macrophages (TAMs), cells that are generally thought to be pro-tumorigenic, but could potentially be reprogrammed back into pro-inflammatory, anti-tumorigenic, cells. There has been increased interest in modulating TAMs for I/O, and targets, such as CSF1R, are being explored by a number of companies. They stated they have identified 10 novel targets to potentially modulate macrophages, and disclosed one of these at AACR last year (abstract here). That target was TIM3, which is also a hot target for T cell biology. Interestingly, they identified a novel interaction of TIM3 with an undisclosed protein on TAMs and developed antibodies that could specifically modulate this interaction. They found that these antibodies did not affect T cell activity, but induced a more pro-inflammatory (anti-tumor) phenotype in macrophages. Based on their pipeline, they are also interested in targeting regulatory T cells as well as B cells. Jounce is also attempting to target so called "Cold Tumors" that appear to lack a strong immune response at the site of the tumor, and is associated with lack of response to current immunotherapies. A number of targets have emerged to try to improve the immune infiltrate in these tumors, such as STING agonists, CXCR4-CXCL12 blockade, and targeting desmoplasia in tumors like pancreatic cancer. They are also developing their own PD-1 antibody (JTX-4014), which they intend to use only for combinations. Jounce's lead program is JTX-2011, which is an agonistic antibody against ICOS (Inducible T-cell Costimulator). 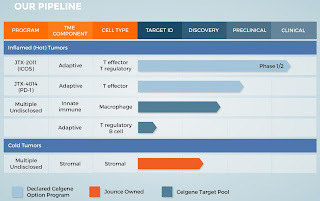 Unlike targeting T cell-inhibitory proteins, such as CTLA-4 or PD-1, to boost the activity of T cells, Jounce is hoping to activate this costimulatory molecule. For background, Jounce presented some preclinical data on their antibody at AACR (abstract here) and a good review of ICOS signaling, and its role in immunity and cancer is available here. ICOS is a costimulatory molecule, similar to CD28, that is typically found on activated CD4 T cells. Activating costimulatory molecules, such as CD28, had been previously tried with a "superagonistic" antibody TGN1412, which caused severe cytokine release syndrome, as detailed here. However, there were mistakes in the clinical development of that antibody, besides the target, that led to those problems. ICOS, as the name suggests, is only upregulated on already activated CD4 T cells, including both effector and regulatory T cells. Jounce hopes that this more specific expression of ICOS, such as at the tumor site, will limit broad overstimulation of the immune system. The presence on both effector and regulatory populations could confound attempts to target it. Jounce suggested that their antibody both activates effector T cells at the tumor site, as well as depletes regulatory T cells (that also express ICOS). This is presumably through antibody-dependent cell-mediated cytotoxicity. Depletion of regulatory T cells has previously been shown to be a potentially critical mechanism of action for CTLA-4 antibodies. So my assumption is that their ICOS agonist antibody is also an IgG1 antibody, like ipilimumab, capable of causing depletion of the cells it binds to. This has the potential to also cause depletion of effector T cells, but in the case of CTLA-4 seemed to be more selective for depletion of tumor-resident regulatory T cells, potentially due to their higher levels of CTLA-4 expression. How this plays out clinically with ICOS antibodies will be important to follow, and I assume we'll be seeing clinical biomarker data on effector:regulatory T cell ratios among others. Jounce is testing its antibody both as a monotherapy, but also in combination with PD-1 antibodies. One of the rationales for this combination is that ICOS+ cells are shown to be increased in patients or mice treated with PD-1 or CTLA-4 blockade (here and here). Notably, ICOS+ cells are increased also in peripheral blood post CTLA-4 blockade in patients, which perhaps might be a concern that this will increase both the potency, but also potential toxicity, of ICOS stimulation in these combinations. Combining ICOS stimulation (through expression of ICOS ligand constitutively, in tumor models) with CTLA-4 blockade has been shown to increase the efficacy of blockade. Jounce presented data showing that, as with many immunotherapy combinations in mouse models, checkpoint blockade efficacy was enhanced by their ICOS agonist antibody. Jounce stated that preclinical data suggested tumors with the highest numbers of ICOS+ cells were the ones most likely to respond to therapy. This provides additional rationale for combinations (e.g. with PD-1) that increase the number of ICOS+ cells. Additionally, Jounce stated that ICOS positivity, by IHC in tumor specimens, will be an important biomarker they use to guide development. There is variability in the amount of ICOS+ cells across tumor types (typically the more "immunogenic" tumor types), as well as variability within a given tumor type. Their initial phase I/II trial testing JTX-2011 as monotherapy, and in combination with anti-PD-1, will be an all-comers trial, whereas their fast-following phase II trial will be focused on typically ICOS high tumor types and using IHC to enroll at least half of patients who have ICOS+ tumors. GSK also has an ICOS agonist antibody in clinical trials (H/T @PDRennert). Jounce also has a partnership with Celgene to develop a number of their products. Jounce received $225 million upfront, a $36 Million equity investment, and there is $2.3 billion in potential milestones (biobucks). There is a 60:40 US profit share on JTX-2011, with royalties on ex-US sales, and US profit sharing on 3 other targets for Celgene as well as shared profits globally on JTX-4014 (PD-1). This partnership is starting with a four year research term. Jounce is backed by some of the leaders in the immuno-oncology field. Their initial target of ICOS does make rational sense based on its known biology. However, efficacy in mouse models is always difficult to project to human efficacy, and this is especially true for immunotherapy. I agree with their biomarker approach in spirit, and hope they will continue to search for predictive biomarkers for both their ICOS antibody as well as future targets. Trying to give the right immunotherapy to the right patients is something that makes a lot of sense, as I've written about previously. Additionally, I appreciate their endeavors to look beyond T cells for attractive targets, such as macrophages or tumor stroma. Jounce has stated that their JTX-2011 all-comers monotherapy and PD-1 combo trial will readout 1H17, and their phase II in ICOS-enriched tumors may read out in 2H17. I will be looking forward to following their progress.